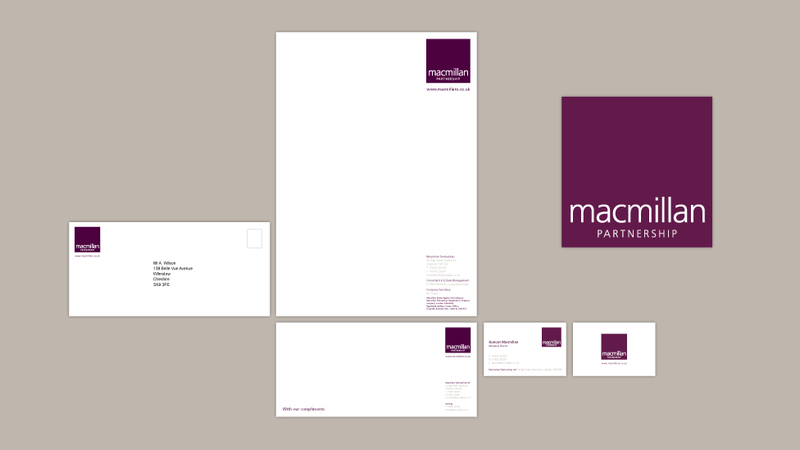 Macmillan Partnership approached Parker Design to produce a comprehensive estate agency branding scheme. This first involved aligning various fragmented identity elements used in the past, and developing them to create suite of materials featuring the new logo which would suitably represent the business and its ethos. We designed a range of logo concepts and supporting business stationery and, in collaboration with the Management team, a final suite of estate agency branding designs were chosen. The logo features an aubergine square symbolising the solid foundations and trustworthy nature of the family-run business, which has been established for more than 17 years. By integrating a very traditional and historic colour combination with a stylish and modern sans-serif typeface we have echoed the ethos of the business, which is ‘traditional values, forward-looking approach’. The supporting stationery reiterates these standards using a minimal, classic design style, the focus of which is the unique colour and typography combination of the logo. By providing the logo with ample space within the designs, we have laid the foundations for the colour especially to become synonymous with the Macmillan estate agency branding. Oakmere Lodge Country Park, set in the idyllic Cheshire countryside, were looking to update their image with a new logo design and marketing materials to satisfy their growing business needs, help drive awareness and improve sales of their holiday lodges. Interior design company MGN approached Parker Design to develop a range of logo design concepts after we were recommended by a professional associate within the property development industry.